Magical Mystery Tour is the name of the 11-song album and 6-song double EP by the English rock band The Beatles, first released as an LP on 27 November 1967 and on 8 December 1967 as a double EP. It is the soundtrack to a one-hour television film of the same name that was originally aired, in black and white, in the UK in 1967. Initially released as a double EP in the UK, the recording was expanded to a full album on subsequent U.S. release, adding several recent singles to the B-side. This has since been adopted by Apple and EMI when the Beatles' discography was being put on Compact Disc, and is the only US release of theirs to do so. When standardising The Beatles' releases for Compact Disc in the late 1980s, the American LP version (which was imported into the UK, peaked on the British album charts at #31 as an American import, and was issued by Parlophone Records in Britain in 1976) was included with the British album line-up instead of the British EP, with true stereo recordings replacing the earlier processed ones. 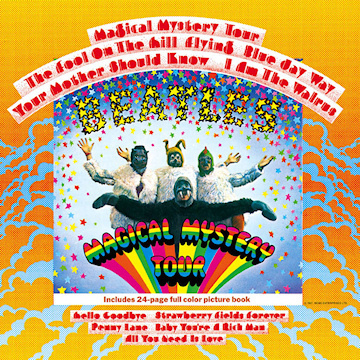 (The true-stereo version of the Magical Mystery Tour LP was first issued in Germany in 1971, but the 1976 Parlophone issue used the Capitol masters with the fake stereo.) Capitol quietly reissued the Magical Mystery Tour LP using the German masters in the US with catalogue number C1-48061 in true stereo. The remaining Beatles non-LP single sides were compiled in the two-volume Past Masters compilation.